This is a cake to love and to celebrate. The linked recipe uses canned cherries, but take this to excellence by using fresh dark Bing cherries. You can make this with canned cherries the rest of the year & no one will complain, but in cherry season go for the best! 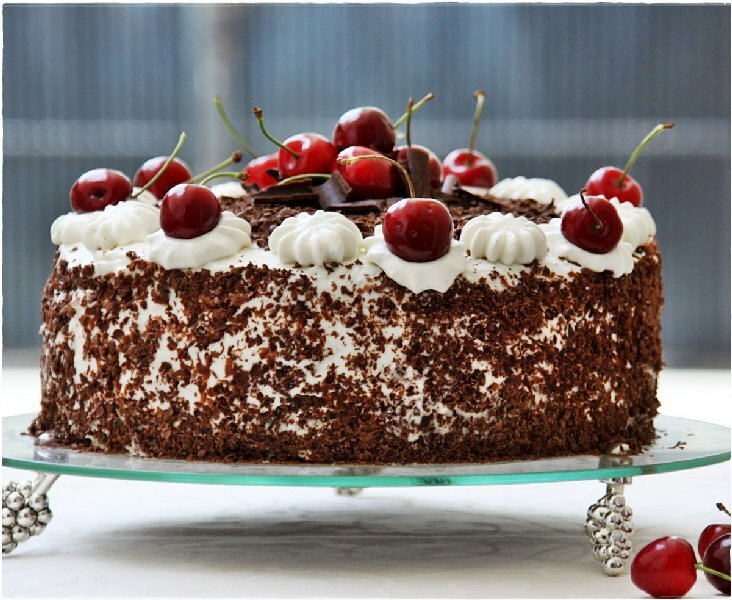 This is an outstanding cake that is soaked in Kirschwasser (Kirsch) made from cherries. It’s cherry brandy, so look for it in the brandy section of the liquor store. The cake is made from scratch using buttermilk which always makes for a superior moist cake. If you don’t have time to make the cake from scratch, use a good quality dark chocolate cake mix (with “the pudding in the mix” if available). The Kirsch and cherries will carry the specialty cake taste. Pit and chop the cherries for the cherry layer inside the cake. Reviewers say to soak the chopped cherries in the Kirsch overnight for an authentic flavor. No matter how you make this famous cake, it will be wonderful. Oh, yes, the Kirsch (cherry brandy) adds a wonderful intense flavor. The combination of flavors and textures make this “out of this world” as my mom used to say. You were very lucky to have this so often as a child! Thanks for sharing your experience, Sicorra! The cherries soaked in Kirsch is one of the many reasons that I love this cake so much! Coming from a German family we too had this cake quite often. The combination of cherries, chocolate and whip cream is amazing. I’m so glad you got to taste it! You will not be sorry you tried this at home, Downsouth! It’s wonderful for entertaining too. Thanks for your comment! I had black forest cake on a Carnival cruise last week and it was so good, I had to go back for seconds! Yummy good and I will be making one soon. Absolutely, Paul! I figure if you’re going to have some BFC, go for the best version! I mean, how often are you going to have it?